The RIM BlackBerry Curve 3G 9330 has a very responsive optical trackpad, convenient external media keys, Wi-Fi, stereo Bluetooth, GPS, EV-DO, a 2-megapixel camera, and a media player. It's upgradable to OS 6, and is very affordable. The BlackBerry Curve 3G 9330 only has EV-DO Rev. 0, the microSD card slot is located behind the battery cover, and photo quality is mediocre. 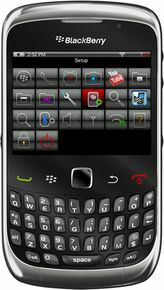 The RIM BlackBerry Curve 3G 9330 has a responsive optical touch pad, a slim profile, external media keys, Wi-Fi, stereo Bluetooth, GPS, EV-DO, and a 2-megapixel camera. It is very affordable. The BlackBerry Curve 3G 9330 is not too different from the Curve 8530 aside from a few cosmetic changes. Photo quality is poor.